Happy 2016!! Where does the time go?!! MOST CLICKED LINK: Rhiannon Hooded Cowl by Morale Fiber – Fabulous convertible cowl that can be worn four different ways … PAID pattern that is on sale now! Chunky Fingerless Gloves by Domestic Bliss Squared – Cute and trendy fingerless gloves … FREE crochet pattern too! Houndstooth At Large Scarf by The Hooked Haberdasher – A stylish and FREE houndstooth scarf crochet pattern! “Squeasie” Mini Top-Model Winter Headband by Sustain My Craft Habit – A super quick and easy (“squeasie”) headband that whips up in less than one hour … FREE knit pattern! Blizzard Warning Pillow by Sew Incredibly Crazy – Beautiful winter themed pillow with link to FREE Blizzard Warning Square crochet pattern! We’re so excited to have our child’s headband pattern featured this week. Thank you so much! 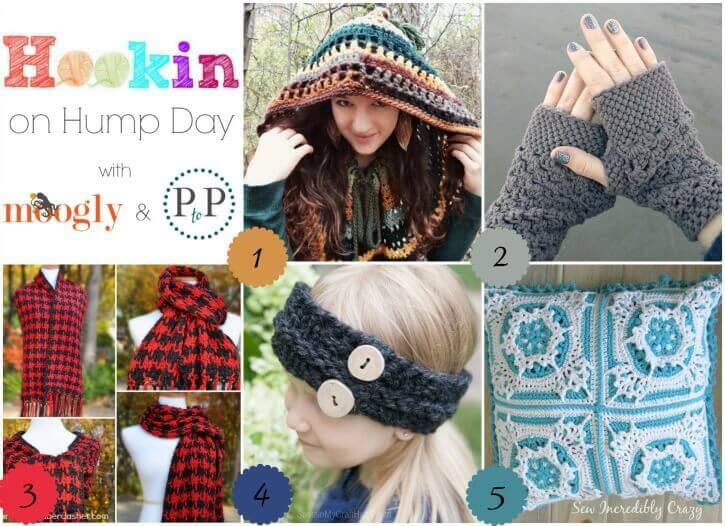 Thank you for featuring my fingerless gloves! Our pleasure! They are gorgeous! !